The Garden Home History Project will be conducting a tour of the historic Crescent Grove Cemetery on S.W. Greenburg Road next to Washington Square. The cemetery was established in 1852, and is the oldest maintained cemetery in the Portland area. Stories about early pioneers such as Augustus Fanno, Charles F. Tigard, the Olesons, McKays and Denneys will be shared. One plot is of the very early pioneers of Garden Home, L.H. 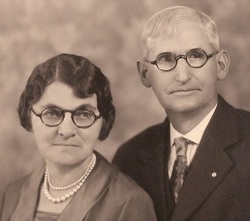 Nichols and his wife who began the first store and post office. Their only daughter Nellie was thrown from her horse and died at age 15. 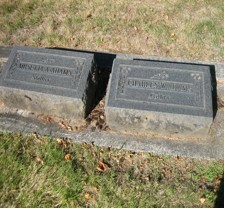 Musetta Amelia and Charles Wesley Adams, Garden Home pioneers from the 1920s and ‘30s have twin tombstones. The Garden Home History Project’s leaders Elaine Shreve and Virginia Vanture will be assisted by Ruth Croft, the previous long-time manager of the cemetery. The tour will begin at the west end of the cemetery, near the mausoleum. Wear good walking shoes. More information is available at GardenHomeHistory.com or the History Board at the Garden Home Recreation Center or call 503-246-5879. This entry was posted in Events, News and tagged Cemeteries, Event, Jager, Nichols. Bookmark the permalink.